I’ve said it before and I’ll say it again – you do not need to be an artist to use visual storytelling to help you be successful in your life, your studies or your work. As long as your audience know what your squiggles represent the process will work. Adding a visual dimension to a conversation gives structure, it aids shared understanding and it creates something memorable to help your conversation live on. 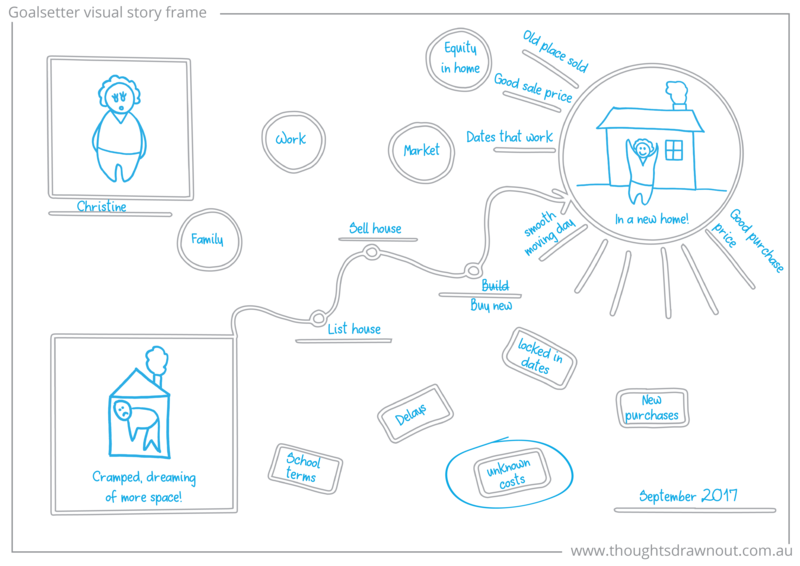 I have pulled together three example scenarios where you could use visual storytelling to steer a conversation. All you need is a pen and paper or a whiteboard and marker. A meeting between multiple parties where they each want a different outcome. This scenario can occur under a number of circumstances, cross-functional projects, or an initiative with multiple third-party stakeholders. In these situations it is easy to talk in circles for a long time and get nowhere. Or one party will become over-bearing and the others lose their voice – usually there is only one happy party by the end when this happens. With the right steering it is possible to reach an outcome where each party feels that their voice has been heard, goals are made transparent and it is understood where they are sympathetic and where they are incoherent. You need to be the whiteboard scribe. It’s now your job to help everyone get it all out, give each person their say and let them see their own words on the board. There are a couple of ways to do this – you can simply give everyone a chance to speak and keep scribing until you have it all. This will give you a mixed bag of info on your board that you will then need to sort into risks, goals etc. A slightly more focused frame that will get you a synthesised outcome faster is to focus the conversation around a central character. Usually the end customer but sometimes it needs to be shareholders or a particular customer segment, work out what central character is going to work for most people. Draw this character in the centre of the board. Now the outcome statements that are written up should be written in the first person from the perspective of the central character. Once everyone has been heard and acknowledged you can move the conversation forward. Now look across everything on the board and identify groupings, themes or overlaps. Is there a logical flow or sequence? Identify any directly conflicting ideas. Through these steps you should be eliminating and grouping to minimise the number of factors on the board and make it a digestible amount of information. You will probably not reach a single outcome but you will have a manageable list and you will have transparency. Sometimes when there is simply too much in your brain, things become unclear, overwhelming even. You need to reframe your own story in order to make it feel manageable again. Start by clearing your mind of every worry, task and question. Just write each one down in a circle randomly all over a page – order doesn’t matter. Once it is all out of your head sit back and review it all. Look for patterns and groupings, maybe what felt like a hundred different things is actually only five or six. Identify the things that no longer seem like something you need to worry about now that they are out of your head, cross these out. Now look for the three things you can do something about immediately and write these on the top left of the page. Everything else on the page needs to get marked with an ‘N’ for next or an ‘L’ for later. You now have a prioritised plan and your story is once again under control. Go you. One on one conversation where you are helping someone to set a plan. This could be helping a friend in a crisis, working with a study partner or maybe as part of your service offering for a clientat work. 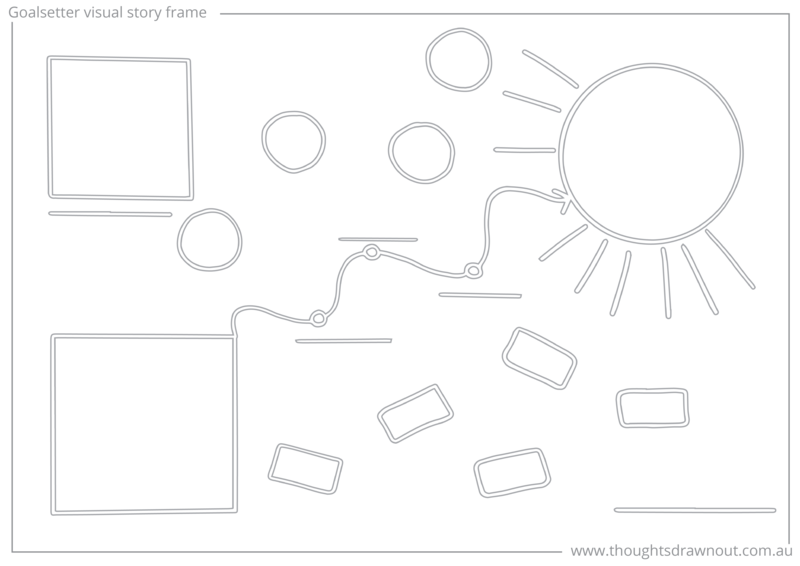 Start with this simple visual frame on your page. Place a box on the left side of the page, a circle on the right and a squiggly line joining the two. Now the two of you have a point of reference in your conversation which can make it easier for you to ask hard questions, they don’t have to feel confronted and they can direct their answer at the page. Have them draw where they are now in the left-hand box. This could be as a series of words, feelings, it could literally be a drawing of their location or their situation. Then around the circle on the right, have them start capturing descriptive and emotive words that describe where they want to be, do this rather than having them go straight to articulating the end game in the circle. Drawing around the edge first allows them to more easily gain clarity on their desired end game. Now that you have a current state and a desired state, you just need to help them work out that squiggly path. Below the line could be risks, fears, obstacles, blockers. Above could be helpers or stepping stones. Add them to the page too, they are the main character after all. So when you go back and re-tell the story that has now formed on the page, tell it from the perspective of the main character and you have successfully generated a visual story on a page!